Coldwater prawns wild caught from the North Atlantic.These Big & Juicy prawns are caught from the very northern waters of the Atlantic around Iceland, Canada, Greenland and Norway (and when the season is right, from the Arctic Ocean around the Svalbard Islands). We strive to select the sweetest prawns with the pinkest colour available. Freshness The prawns are whole and have been cooked immediately after catching then frozen within minutes ensuring the flavour and wholesomeness is locked in. The shell is soft so can be easily peeled with your fingers. Defrosting. 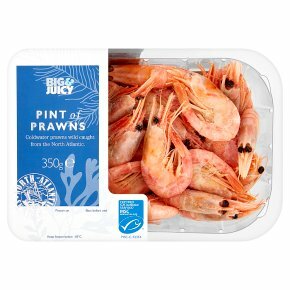 These prawns are easy to defrost, simply leave to stand in cold water for 10-15 mins, alternatively defrost overnight in the fridge.